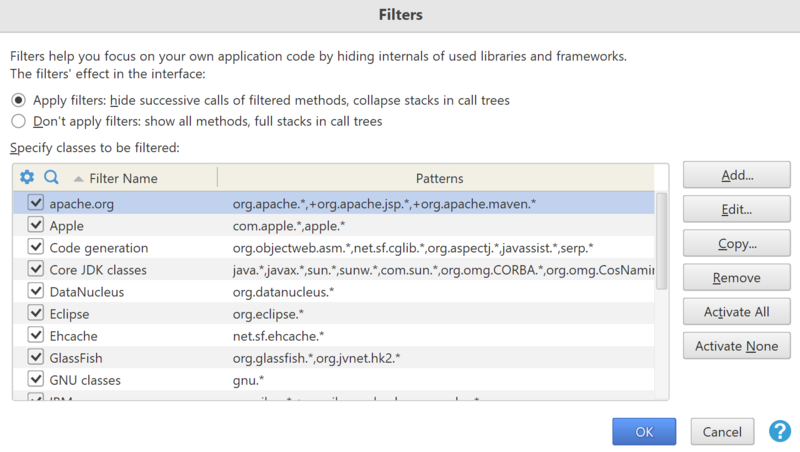 Filters help you to ignore methods and instances of classes which you are not interested in, such as standard Java classes, libraries, framework internals, application server core classes etc., so you can more easily focus on own classes of the profiled application. While reviewing profiling results in a snapshot or in live views, you can use different filters or use none at all. In other words, you do not need to start a new profiling session to start or stop using filters. Views are automatically updated when filter settings are changed. Filters reduce the depth of call trees and length of stack traces, by skipping successive calls of methods from filtered classes, so you can more easily see the methods of the profiled application. Filters are applied to views where method call stacks are shown, as well as to hot spot and method list views. Some automatic inspections use filter settings to focus on potential problems in own code of profiled application. Use Settings | Filters... in the main menu to configure filters. Each filter is specified as a list of class or method patterns to be filtered, one pattern per line. To specify classes or methods which must not be filtered, prepend the pattern with '+'.